MAKING THE MOST OF CHRISTMAS IS NOT GOING OVERBOARD ON YOUR CREDIT CARD AND GORGING ON TURKEY, BUT COMING TO A LIFE-CHANGING REALISATION OF THE TRUE REASON FOR THE SEASON. That is part of the Gospel that will be preached from most pulpits this Christmas, but millions are missing out simply because they’re not being invited to carol services. Christmas is the time when everyone is more receptive to the good news of salvation, according to the evangelist who preached to over 20,000 Londoners last summer. Canon J John is now seeking to embolden Christians around the country ready for many more stadium events; they are called ‘JustOne’ as Christians bring ‘just one’ guest. In fact, J John and his wife brought just 77 to London’s Emirates stadium and he encouraged others to do likewise. 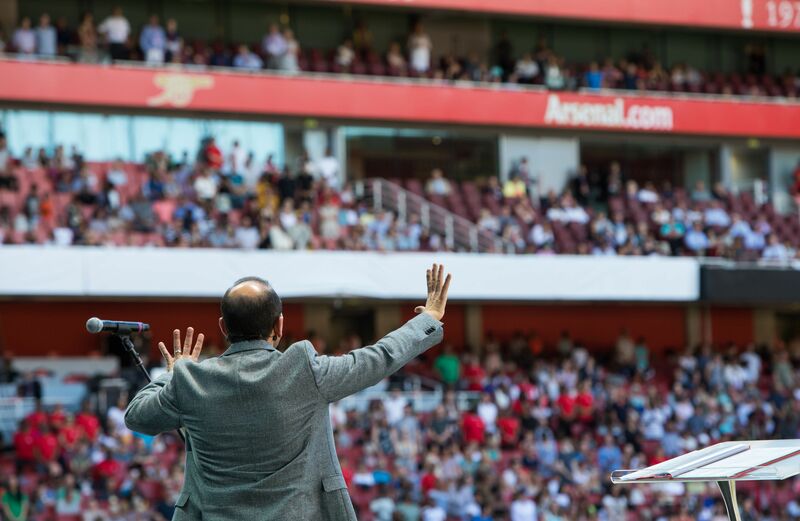 Kent has been chosen to hold the next JustOne event; local church leaders are praying to see a repeat of the scenes at London’s Emirates Stadium where thousands found faith. Spearheading Kent’s effort are Pastor Peter Marchand and David Hadlum, leader of Chatham Evangelical Church, assisted by church administrator Ms Chris Jenkin. Between them they had organised nine people to phone around Kent churches over the past few months. Thus hundreds of churchgoers turned out on a Saturday morning in October to hear J John’s message. The launch was hosted by Kingsway International Christian Centre (KICC) on their vast property, a former go-karting circuit, outside Maidstone. Next year’s JustOne event will take place on 9 June at Gillingham Football Club’s Priestfield Stadium.